When looking at churches as we go about our daily tasks, we are often quite unaware of the history behind both the premises and the congregation. I am sure this was true of the United Reformed Church in Linden Road. Its story goes back to November, 1812, when a room was used at the home of Thomas Goldring for the purpose of preaching. Within three years, a small chapel existed at No 30 Chichester Road. This chapel was situated near Springfield, which was to become the Bognor Hospital. This is within 17 years of Sir Richard Hotham’s death. By 1817, the town map clearly shows the ‘meeting house’ in Chichester Road. Nine years later, the Rev Matthew Wilks ‘conveyed land’ in Dorset Gardens, which was then a cul-de-sac, for 10/- (50p) to the Rev James Edwards for the erection of a chapel, which became known as Hanover Chapel in ‘deference to the Royal House’ of the time. It was opened on August 31, at a cost of £300 and provided seating for 200 people. The 1852 Town Guide mentioned that the ‘Hanover chapel belongs to trusts for the use of Congregational Independents.’ There were only three burials carried out at the chapel, but later they were removed to the New Town cemetery in Town Cross Avenue. 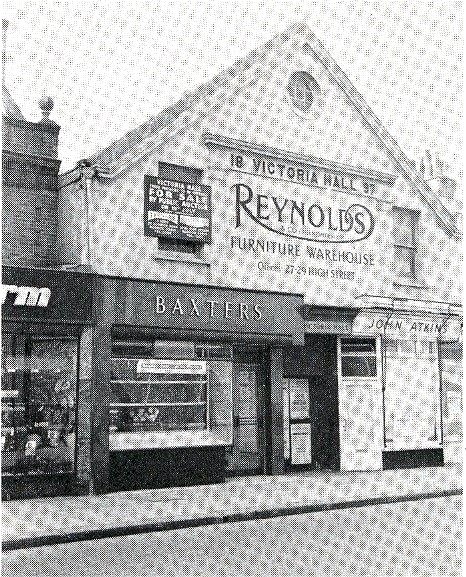 A site was purchased on the junction of London Road and the High Street. This was an area that had been used by farmer Mr Munday to keep his cows. The Hanover Chapel then continued to be used as a Sunday school and lecture hall. Eventually, in 1897, this building was renamed The Victoria Theatre and was used by touring companies to entertain Bognor residents. This building was situated opposite St. John’s Church, today the site of Boots. In 1920, the Reynolds family purchased the hall and it became an auction room and store. The church and its religious fortunes continued and in 1910 Mr William Hounson from Hove purchased a plot of land on the east side of London Road. By January 11, 1911, the building was opened and consisted of two floors with a porch entrance and a small front garden. By 1963, this building, which was situated behind the Hansford shop, was used as the town library. It was eventually sold to Timothy Whites and Co for £17,000. A clause was inserted that stated: “that no building now erected or hereafter to be erected on the land or any part thereof shall at any time hereafter be used as premises licensed for the sale of alcoholic liquor other that medicated or medicinal wines.” In addition, there was a ban made on the use of the site for a theatre, cinematograph or dance hall. A new site was eventually found in Linden Road, which was part of the kitchen garden of a house called The Hawthorns. The new church was constructed by the building company of Messrs HW Seymour and Co of Bognor. On December 11, 1929, the foundation stone was laid in Linden Road at today’s site. By 1930, the new church in Linden Road, which had cost £21,334 8s 7d (£21,334.43) was opened on Wednesday, October 29, with a dedication service. Also, in 1930, the Institute in London Road was sold to Mr Hansford. The church year book for 1930 described the new church as being arranged to ‘form a composite building,’ because the church had its main entrance in Linden Road but was separate from the adjoining hall. The church was ‘cruciform in plan, with a chancel 21 feet by 18 feet forming the head of the cross.’ Another feature was that, while the church had its main entrance in Linden Road, there was a small walkway through from Burnham Avenue allowing people to enter the church from the north and south with equal ease. During the Second World War, the Sunday school premises was used by the Duppas School from Croydon and also two air raid shelters were erected to the west side of the church. In 1942, the church was bombed, and the north window was damaged. After the war, the West Sussex education authorities took over the school and used the premises for the Michael Ayres School’s pupils until their school was completed. By 1946, the Manse had been purchased in Linden Road, thus completing the journey of this church from its humble beginnings in Chichester Road in 1812. During the 1980s the church was even seen regularly on national television as Dave Allen, the comedian, used it for his ‘confessional scenes’ in his television series. The church was paid a nominal £10 by the TV company towards church funds. The church held its last service in July, 2010, and, after much rumour about its fate, it was reopened as a community centre – including several churches – and renamed ‘Jeneses’. It is good to hear of a church that is so busy. Today it is very much a community-based facility both for religion and a meeting hub for many organisations. Also, through everyone’s hard work,the building has been saved for the future for the purpose for which it was built.